A variety of activities occur the weekends during February. Included are fishing tournaments, gallery stroll, polar dip, cross country skiing, sledding, wine tasting and craft beer fest. Here's what's scheduled for 2019. Activities may change as date gets closer. Sledding at Pentwater Village Green, all day, weather permitting. Barrel racing on ice, 1-2pm, Lake St. boat launch on Pentwater Lake. Snowman Scram 5k Run/Walk and 1 Mile Fun Run. Advance registration: $15/1 Mile Fun Run; $25/5k Run/Walk, Win with Wellness Fit Club members free. 1 Mile starts at 12noon, 5K follows. Start and finish at Pentwater Public School. Pentwater Pathways Open for cross-country skiing. Skis provided 12pm-3pm. Free event including Cross Country Skiing, hot chocolate, cookies and campfire at trailhead. Two Town Tasting (formerly Corks & Canvas) Wine Tasting & Gallery Stroll from 1-4pm in Hart and from 2-5pm at galleries in Pentwater. Advanced tickets are $20; $25 at the door. Mardi Gras Party at the Antler Bar, starting at 5pm. 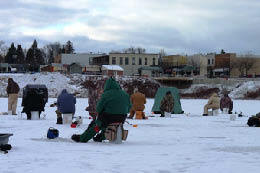 Ryan Williams' Lake Perch Fishing Tournament, 7am-2:30pm. Register at Pentwater Convenience Center. Weighin at 4pm at Boathouse Bar & Grille. Freezin' for a Reason (Polar Dip in Pentwater Lake), at the noon whistle, Pentwater Boat Launch. Jump in and freeze in Pentwater Lake, with proceeds going toward the Crystal Valley Care Fund and Chamber events. Register at www.pentwater.org. Lego Building Contest, 1pm-2pm upstairs Shelby State Bank, various age groups. Colleen Plummer Memorial Craft Beer and Music Fest to benefit COVE, noon. Sponsored by The Antler Bar, Brown Bear, The Village Pub and the Boathouse Bar & Grille. Tickets: $25 per person in advance, $30 at the door. Activities are listed with information available at the time. For more information, visit www.pentwater.org.